NBC announced that its second-year comedy series Whitney will return to its primetime lineup on Wednesday, November 14 at 8:00pm ET/PT replacing Animal Practice, which is now canceled. However, as of now, three more airings will air in the next three weeks (Oct. 24, 31 and Nov. 7). The ratings have been pretty bad as this past Wednesday's episode did only a 1.1 adults 18-49 rating. 13 episodes were ordered, but its not known how many they have taped. We know it is at least 8. 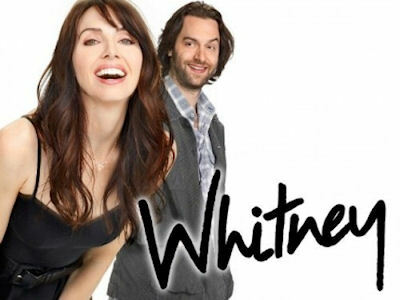 On Whitney, Whitney Cummings stars in the title role in the multi-camera series which is a look at modern-day love and relationships which centers around Whitney (Cummings, Chelsea Lately) and Alex (Chris D'Elia), a happily - newly "married" couple. Surrounded by a quirky group of friends, Zoe Lister-Jones, Rhea Seehorn, Dan O'Brien (How I Met Your Mother), and Tone Bell (new to the second season of the show). The series is produced by Universal Television and Stuber Television. The executive producers are Scott Stuber, Quan Phung, Wil Calhoun and Barry Katz. Andy Ackerman (Seinfeld) is the director and an EP. For the week of October 22-26, 2012, we have many current sitcom stars and past sitcom stars on TV talk shows! All times listed are Eastern. So get your DVR's (or whatever you use) ready! Ready? Here is all what you need to know for the coming week! Tom Hanks (Bosom Buddies) - Watch Tom on The Late Show with David Letterman at 11:35pm on CBS. Cloud Atlas opens in theaters on October 26. Kevin James (The King of Queens) - Kevin appears on a repeat of Jimmy Kimmel Live! at 12am on ABC. Bryan Cranston (Malcolm in the Middle) - Bryan drops by The Late Late Show with Craig Ferguson at 12:37am on CBS. D.L. Hughley (The Hughleys) - D.L. visits Comedy Central's The Daily Show with Jon Stewart at 11pm. Aziz Ansari (Parks and Recreation) - Aziz is a guest on Conan at 11pm on TBS. Chuck Lorre (Creator of The Big Bang Theory/Two and a Half Men/Dharma & Greg) - Tune in to see Chuck on Conan at 11pm on TBS. Elisha Cuthbert (Happy Endings) - Elisha stops by ABC's Good Morning America between 7-9am. She will also be on LIVE! with Kelly and Michael, so check your listings. Happy Endings returns Tuesday, October 23 at 9:00/8:00c on ABC. Victoria Justice (Victorious/Zoey 101) - Victoria appears on LIVE! with Kelly and Michael, so check your listings. Beth Behrs (2 Broke Girls) - Beth chats on The Ellen DeGeneres Show, so check listings. Valerie Bertinelli (Hot in Cleveland/One Day at a Time) - Valerie talks about her weight loss and how she kept it off on The Dr. Oz Show, so check your local listings. Bob Saget (How I Met Your Mother/Full House) - Bob visits Current TV's Joy Behar: Say Anything! at 6pm. Penny Marshall (Laverne & Shirley) - Penny appears on Current TV's (Joy Behar: Say Anything! at 6pm. Scott Baio (See Dad Run/Charles in Charge/Happy Days) - Scott is a guest on Watch What Happens: Live at 11pm on Bravo. Will Arnett (Up All Night/Arrested Development) - Catch Will on Conan at 11pm on TBS. Tom Hanks (Bosom Buddies) - Tom continues to make the rounds on Late Night with Jimmy Fallon at 12:37am on NBC. Victoria Justice (Victorious/Zoey 101) - Victoria appears on Late Night with Jimmy Fallon at 12:37am on NBC. Harry Shearer (The Simpsons) - Harry is a guest on Conan at 11pm on TBS. Krysten Ritter (Don't Trust the B---- in Apartment 23) - Krysten visits LIVE! with Kelly and Michael, so check your listings. Don't Trust the B---- in Apartment 23 returns Tuesday, October 23 at 9:30/8:30c on ABC. Portia de Rossi (Arrested Development/Better Off Ted) - Portia appears on The Ellen DeGeneres Show, so check listings. Jerry O'Connell (Carpoolers/My Secret Identity) - Jerry drops by The Ellen DeGeneres Show, so check listings. Anthony Anderson (Guys with Kids/All About the Andersons) - Anthony is a guest on The Talk on CBS at 2pm ET/1pm CT-PT. Yvette Nicole Brown (Community) - Yvette stops by The Wendy Williams Show at 12am on BET or on your local stations. Ana Gasteyer (Suburgatory) - Watch Ana on Jimmy Kimmel Live! at 12am on ABC. Chris D'Elia (Whitney) - Chris appears on Late Night with Jimmy Fallon at 12:37am on NBC. Helen Hunt (Mad About You) - Helen is a guest on The Ellen DeGeneres Show, so check listings. She will also be on Chelsea Lately on E! at 11pm. Rainn Wilson (The Office) - Rainn visits Conan at 11pm on TBS. Ted Danson (Cheers/Becker) - Ted appears on LIVE! with Kelly and Michael, so check your listings. Jack McBrayer (30 Rock) - Jack stops by LIVE! with Kelly and Michael, so check your listings. Jamie Lynn Sigler (Guys with Kids - Jamie Lynn chats on The Wendy Williams Show at 12am on BET or on your local stations. Dreama Walker, Krysten Ritter and James Van Der Beek - The cast of Don't Trust the B---- in Apartment 23 appears on ABC's Good Morning America between 7-9am. Katey Sagal (Married with Children/8 Simple Rules) - Katey chats with the ladies of The View on ABC at 11am ET/10am CT-PT. Kaitlin Olson (It's Always Sunny in Philadelphia) - Kaitlin visits Conan at 11pm on TBS. Rosie O'Donnell (Gimme a Break) - Rosie gives her first interview since the heart attack she never saw coming on The Dr. Oz Show, so check your local listings. Kevin Nealon (Weeds/Hiller and Diller/Champs) - Kevin plays the banjo on Marie on Hallmark Channel at 12pm ET/PT. Yvette Nicole Brown (Community) - Yvette continues to make the rounds on Current TV's Joy Behar: Say Anything at 6pm. Dreama Walker (Don't Trust the B---- in Apartment 23) - Dreama is a guest on Watch What Happens: Live at 11pm on Bravo. Krysten Ritter (Don't Trust the B---- in Apartment 23) - Watch Krysten on The Late Show with David Letterman at 11:35pm on CBS. Sarah Silverman (The Sarah Silverman Program) - Sarah drops by The Tonight Show with Jay Leno at 11:35pm on NBC. James Van Der Beek (Don't Trust the B---- in Apartment 23) - James visits Late Night with Jimmy Fallon at 12:37am on NBC. Amanda Peet (Bent) - Tune in to see Amanda on The Late Late Show with Craig Ferguson at 12:37am on CBS. John Cho (Go On/Kitchen Confidential) - John appears on The Late Late Show with Craig Ferguson at 12:37am on CBS. Miley Cyrus (Hannah Montana) - Miley is a guest on a repeat of Chelsea Lately on E! at 11pm. Geena Davis (Buffalo Bill/The Geena Davis Show) - Geena celebrates the 20th anniversary of her beloved film A League of Their Own on The View on ABC at 11am ET/10am CT-PT. Scott Baio (See Dad Run/Charles in Charge/Happy Days) - Scott stops by The Talk on CBS at 2pm ET/1pm CT-PT.